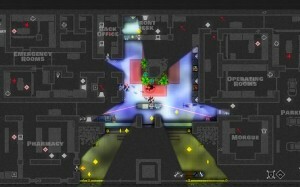 The Lookout shows enemies on the map while holding still or sneaking. 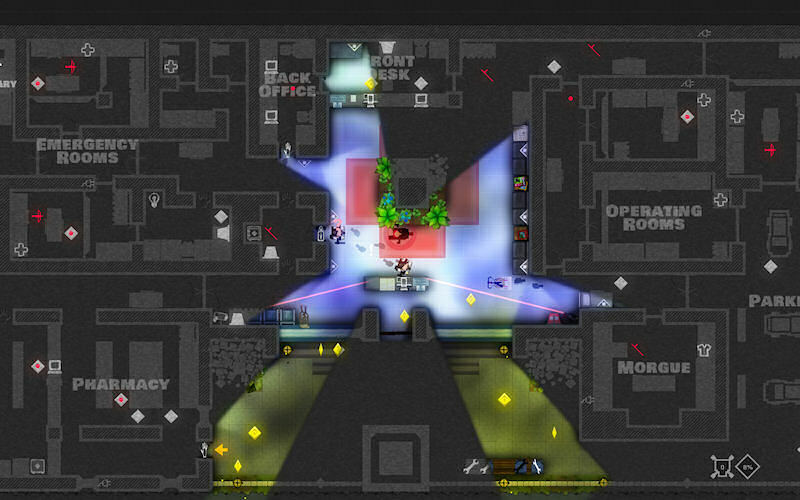 Monaco is a single-player and co-op 2D game about building a team of thieves and pulling off the perfect heist. We bought Monaco on Steam this afternoon, and we’ve already had a ton of hilarious experiences and memorable/catastrophic heists. Following a loose story, the gameplay moves from location to location introducing and unlocking new characters as you go. The Cleaner, Lookout, Pickpocket, Gentleman, Hacker, Mole, etc., each provide a unique skill-set (as you’d imagine) to help sneak around and complete objectives. Hacking computers, picking locks, disabling alarms, and collecting coins (which refill ammo and provide a score/additional objective) are just a few things you’ll be doing. Sneaking, jumping into bushes, putting on disguises, and even blowing away guards with a shotgun are just a few more. While I’m sure it’s fun solo, Monaco really shines as a co-op experience. Graev and I are constantly regretting going too fast or not fast enough. We try to combine different characters to see if they perform better together (example: The Cleaner and The Lookout are a great combo). I can only imagine what a group of four would be like. If you’re looking for a well-deigned and relatively cheap game that feels quite unique, Monaco: What’s Yours Is Mine is proving to be a lot of fun.